KUALA LUMPUR: The ringgit depreciated to a nine-month low against the US dollar yesterday, weighed by emerging market contagion risks. On the same day, the Malaysian central bank announced it would keep the overnight policy rate at 3.25%, as it acknowledged that the local economy faces downside risks from heightened trade tensions in the immediate term. At the time of writing, the ringgit was trading at 4.1477 against the greenback, the lowest seen since November. In the past one year, the local note has vacillated from as strong as 3.8620 to as weak as 4.2600. UOB Malaysia senior economist Julia Goh said the current weakness is inevitable as the country faces prospects of slower growth, fiscal risks and near-term domestic policy uncertainties. Moreover, she said threats of more US-China tariffs loom, while the possibility of less accommodative G3 (US, Europe and Japan) monetary policies and emerging market contagion risks weigh on the ringgit. The ringgit, which has been on a downtrend against the US dollar throughout most of this year, has continued to weaken even after Malaysia’s May general election — which saw a peaceful change of government for the first time in the country’s history since independence. It passed the 4.00 level in mid-June. But it is not the only currency that weakened against the US dollar. In fact, the local note has fared much better when compared with the fate of other major currencies against the greenback. On a 12-month basis, the ringgit has strengthened about 2.19% against the greenback. In contrast, the Singapore dollar has weakened 2.07% against the US dollar, while the Japanese yen has lost 2.12%, and the Chinese yuan is down 4.5%, according to Bloomberg data. 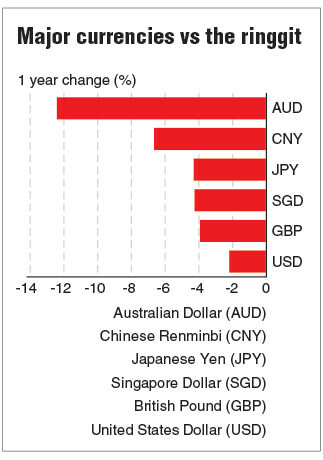 The British pound is also down 1.7% against the US dollar, while the Aussie dollar fell 10.29%. Since weakening past the 4.00 threshold in mid-June, the ringgit has not strengthened beyond that level. It is likely to reach 4.20 by year end, as the US dollar continues to strengthen on higher US rates and global trade tensions, Bloomberg reported, quoting DBS economist Irvin Seah.